President Muhammadu Buhari during his meeting with the Nigerian community in China. President Muhammadu Buhari on Sunday said he was not afraid of free and fair elections in 2019. He said as a beneficiary of credible elections, he would ensure that his administration organises free and fair elections. 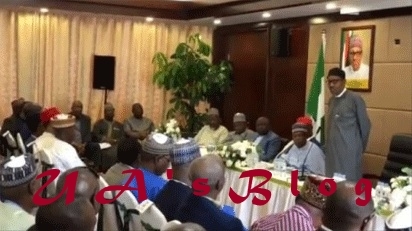 According to a statement by his Senior Special Assistant on Media and Publicity, Garba Shehu, the President said this in Beijing during an interactive session he had with members of the Nigerian community in China. Buhari is in the country to participate in the 7th Summit of the Forum on China-Africa Cooperation scheduled to hold from September 3 to 4 in Beijing. He added that the terrorist group no longer controls any part of the country. “You will all recall that we contested the last election basically on three issues, which includes security, especially in the North East. “The Boko Haram used to occupy quite a number of local governments in Borno State but they are not in anyone now.